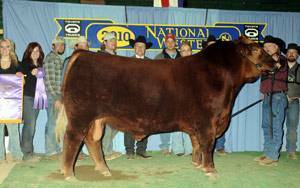 True Blood is the 2010 NWSS Grand Champion Bull and is a maternal brother to Red Northline Rev 341R. 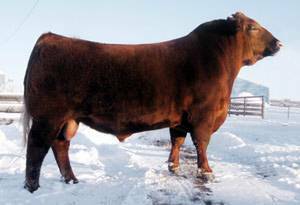 He is sired by HCF Red Rock 212, the 2003 Denver Stock Show Champion Red Angus Bull Calf and Reserve Grand Champion Red Angus Bull. True Blood’s paternal Granddam is the most noted Stony cow in the Hidden Creek program. True Blood is an exceptionally sound footed and structurally correct bull. He has tremendous testicles, rib shape and depth. True Blood is an exceptionally easy fleshing individual.